Graham cracker crusts can be a crunchy, delicious part of an ice cream or pudding pie. But if you are gluten-intolerant, a graham crust can make those desserts off limits. For my father’s recent birthday, I created a version he could enjoy using almond meal. I think my kids loved the nutty, crunchy crust even more than he did! This is a great option for any dessert in which you wish to play up the nutty flavor. 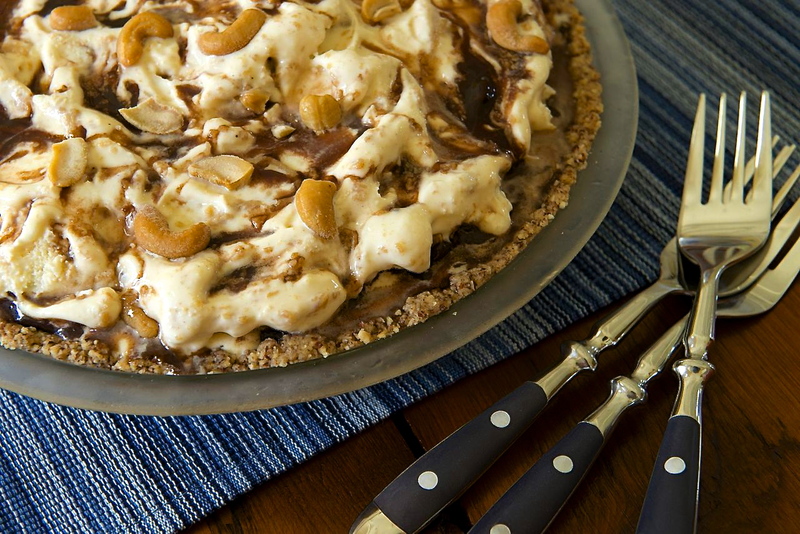 Coarsely ground almond meal creates a crust similar in texture to a graham cracker crust. This recipe is best suited to a filling that does not require baking as nut-based crusts don’t fare as well when baked for extended periods of time. If you wish to try, cover the edges with a crust protector (a homemade foil version will do) to prevent over-browning and start out with a well-greased pie plate. Whisk the dry ingredients together. Then add butter or coconut oil and water. Knead dough until well combined. Then press the dough into a greased 9-inch pie plate, working the mixture up the sides. Bake 10 minutes or until lightly golden. Cool completely. You may omit the sugar if you wish to use this crust for a savory recipe. 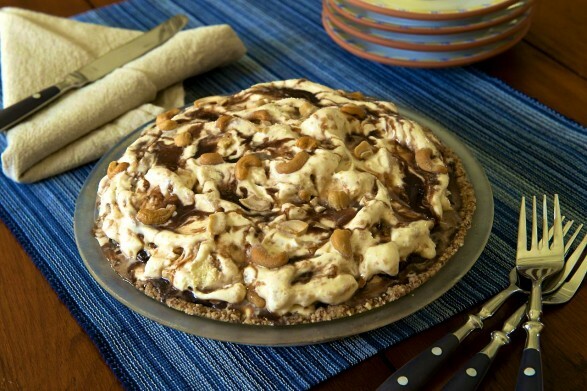 For the recipe for Hot Fudge Peanut Butter Ice Cream Pie, click here. Thank you very much for the nice comment, Chris. I hope you continue to find helpful recipes here and visit often! Love this crust, Ann!!!! I am featuring you on my Fit and Fab post tomorrow! I am so glad you are getting some good ideas! There are actually quite a few recipes beyond the ones in the specific “gluten free” category. Some things are just naturally gluten free so I don’t necessarily include them. Then, there are some things that can easily be gluten free if a gluten-free product is chosen–like soy sauce which isn’t always GF but can be. Also, if they can eat gluten-free oats, I have lots of baked oatmeal recipes that may be of interest. Finally, the gluten-free flour blend is a great cup-for-cup substitution and I use it in muffins, cakes, quick breads, etc. Hope you enjoy!! We enjoyed this crust recipe! I used it for my traditional Cherry-O-Cream Cheese pie which calls for a graham cracker crust. Thank you! Hmm… I didn’t have good luck with this. I was enlisted to provide gluten/dairy free pumpkin pie for a dinner meeting. I used Bob’s Red Mill finely ground almond flour. The dough looked oily from the start and after I formed it in the pan I pressed out as much oil as I could with paper towels. Then the edges of the crust browned very rapidly. (I had just baked a regular pie for an hour without needing to cover the crust but this one was too dark in 15 min.) Sadly, the bottom of the pie was thoroughly soggy when done, absolute mush. I could envision pre-baking for a no-bake filling, but this did not work for me as an unbaked crust. Good luck that only one person had a piece, and my kids certainly aren’t picky about leftover pie, soggy or not! That makes me feel better! One last thing I thought of is that I make this crust with almond meal instead of the finer flour to mimic a graham cracker crust. The picture shows how hearty it is. That, along with a wetter filling requiring an extended bake time, might explain the difference. Thanks again for taking the time to share your feedback. Hi Debbie, As I mention just above the ingredients, the risk is over-browning it. I might pre-bake briefly and then use a crust protector (or a ring cut out of foil) to protect it. For another option, you can look at this recipe: https://fountainavenuekitchen.com/almond-flour-pie-crust-gluten-free/. I do pre-bake this one, but one commenter (Scott) mentioned that he did not and said it turned out well. Hope this helps! May I use this recipe to make Sweet Potato cheesecake which needs to be baked? I don’t typically use this crust for baked pies (or cheesecake! ), but I think it will be fine if you account for one detail. Any exposed areas of the crust may become a little too brown, so I’d recommend a crust protector–even one that you fashion out of foil. Where the hell is the recipe. Your site is giving text on how wonderful the almond flour crust is but NO recipe. How about if you show the pic then the recipe. I do not have all day to read through the website and then not get the recipe. If you are trying to print the recipe and it doesn’t seem to be working, your browser could be opening a new tab. But realistically, if it’s truly a problem for you, there may be other sites that better suit your needs. Followed the recipe to a T and can honestly say this does not work. Texture is pretty dry and crumbly, pretty disappointed to waste all these almonds and coconut oil. I’m very sorry this didn’t work for you, Nick. Did you use it for a no-bake pie or something that required baking twice? How would I adjust this for a homemade custard pie that is cooked in the oven? I am thinking of adding some berries to the pie. Hi Rita, I haven’t used this for a custard pie, although I’ve found that the primary thing to watch for when baking the crust is over-browning. The custard and fruit would make for a very wet filling, but in theory the almond crust should maintain its integrity. I’d be inclined to try it, although I don’t think I’d do it the first time for company! If you try, I’d love to know how you make out.